Ok, so you have some railings that are in dire need of DIY or at least a little inspiration?? 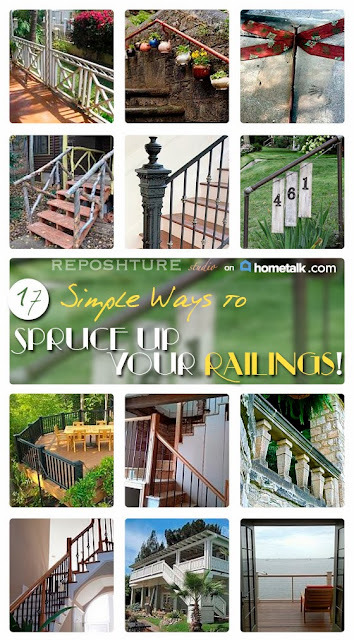 Hometalk asked me to gather some ideas from their website about how to make your railings go from hum-drum to WOO-HOO! If you haven't checked out Hometalk yet, please do. It is an amazing resource for everything home. That includes decorating inspiration but you can ask questions and you get professionals from that field that can really give you great advice. And I love that you can be a regular joe (although there are many bloggers on Hometalk) and post pictures of stuff you have made and things that you find inspiring. That is a win in my book. So if your railings need some WOO-HOO, click on the graphic and it will take you right to my board and you can click on each individual photo to see the full post. These are some great ideas. Yours is still one of my favorite updates. :) I love Hometalk too.